Etymology: "cotinus" comes from Greek kotinos, " wild olive tree ". The nickname "tree with wigs" alluded to the light and stringy inflorescence. Origin: Mediterranean periphery and Eurasia to China. Maximum size : 6 m tall. But it is shrub in culture. Deciduous foliage. Leaves are born red, turn green before summer and finish at fall again deep red. 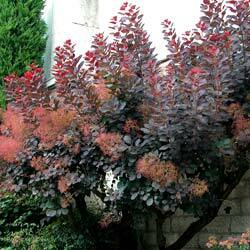 A variety is crimson all year long (Royal "purple Cotinus coggygria"). Female inflorescence made by a multitude of feathery peduncles in broad panicles (hence the nickname of '"tree with wigs"), giving the impression of a small smoke cloud. After blossoming, in June-July, most flowers abort, and there remain only peduncles. Only some flowers succeed in producing small fruits. Use: decorative garden shrub. From its wood, an orangy tincture is drawn. Advices of maintenance: in summer, prune stems dried out under the first leaves appearing on the stem dried out. In normal situation, pruning is not generally necessary, safe to define its form a bit when a branch gets lost, for example. Fertilization must remain very limited. American species (Cotinus americanus or Cotinus obovatus or "American Smoketree"). Contrary to European Cotinus, it is a tree (nice examples in Kew Gardens, exceeding 10 m tall). It grows in altitude on limestones. Its leaf is bigger, reaching 13 cm long, obovate and cuneate at the base. The intensive use during Secession War, to extract from it the tincture of uniforms, would have considerably rarefied it.